The booths and fair tents have now been vacated, and life in Miami restored to normal traffic woes. But the female voices present at Miami Art Week – an annual flurry of fairs that descend upon the city each December – have resonated far beyond these temporary events. Amongst the stream of educational seminars held during Miami Art Week, one emphasized the importance of supporting female artists and dealers. Moderated by the Founder and CEO of the Association of Women Art Dealers (AWAD), Susan Mumford, “Unconscious Bias and the Art World” took place on Friday, December 2nd in partnership with Aqua Art Miami. Jenkins Johnson Gallery (San Francisco) presented From Here: a solo show by interdisciplinary artist Sadie Barnette. 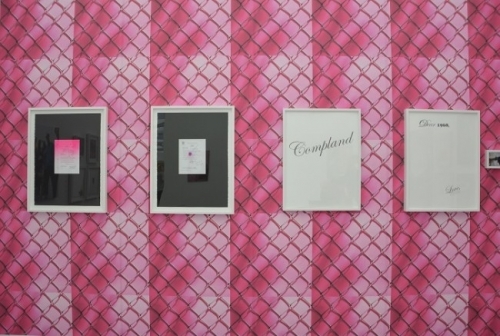 A chain-link fence print was juxtaposed with a hot pink backdrop for what appeared to be framed mementos, but were actually excerpts from an FBI Surveillance file on Barnette’s father. He was a founder of the Compton, California chapter of the Black Panther Party, a member of the National United Committee to Free Angela Davis, and he opened the first black-owned gay bar in San Francisco.